Coming back from an amazing 2 weeks working with Hyderabad Urban Lab (HUL) in Hyderabad, the group boarded a train that, in 13 hours would take us back to Chennai, where we are staying in the city itself rather than in Tambaram. 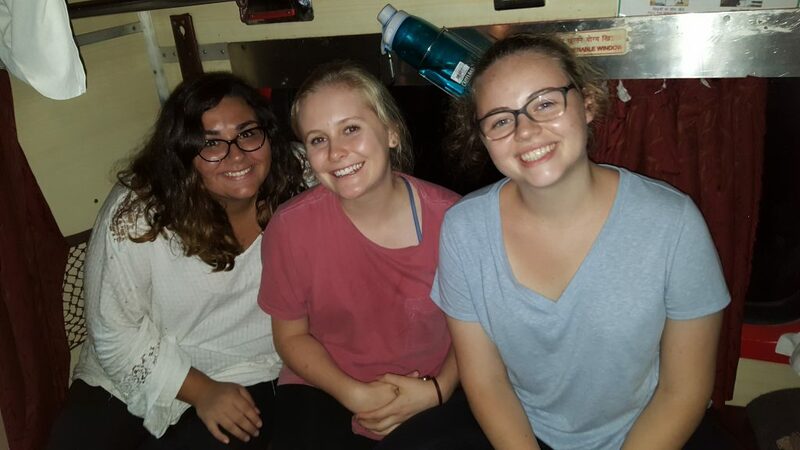 The train was set up in a cool way; it had beds hanging from the ceiling and beds that folded out from the seats that connected to the ground. The bathroom, however, was kind of rough. Though it was alright to use in emergency, there was definitely a distinct smell of urine that lingered with you even after you came back from the restroom. Most of us got limited or fitful sleep and many of us were sick or just recovering from being sick. It wasn’t the best time ever but it also wasn’t the worst. We made the best of it by reading, playing games (Reyna, Sophia, Evelyn and I played a game of LIFE the board game on Evelyn’s iPad), chatting with each other and sleeping if we could. 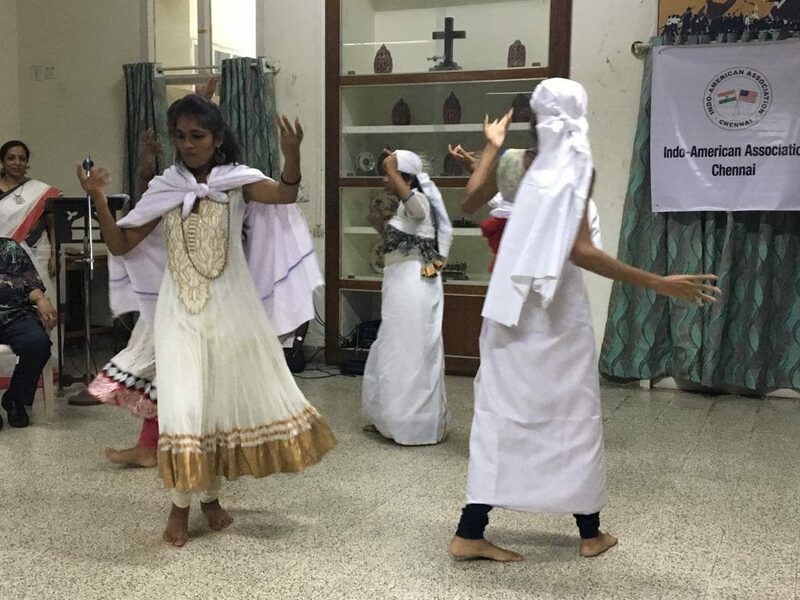 The day felt long but at the end there was a gathering with the Indian American Association at the place we are currently staying at, the Young Women’s Christian Association (YWCA) in Chennai. 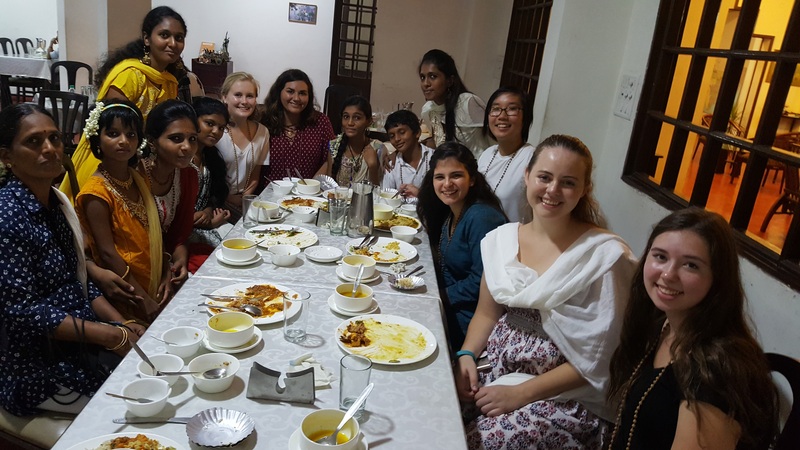 The group that put together the gathering was the Indo-American Association of Chennai (IAA) and it basically consisted of our group and eminent individuals from the city, including people from tribal communities that have existed in India for hundreds of years. We saw two tribal communities, the Toda and the Badaga tribe. The night was interesting in its format but it all flowed very well from speeches by the organizers to dances by each tribe to questions we had of the tribes and finally to the closing of the event. Each tribe was introduced by the organizers of the event so here is some of the information that they gave us mixed in with some information I found on the internet that also corroborated what they told us. The Toda tribe typically wears cloth that fully covers their bodies made of hand embroidered red and black threads on top of a white background. They worship the buffalo as central to their religion and traditionally (though now not so much) practice “fraternal polyandry” which is the marriage of a woman to all of the brothers of another family. The Toda tribe consists of around 700-900 individuals currently. The Badaga tribe currently resides in the Nilgiri mountains like the Toda tribe but they were apparently once from the North, with their name literally translating to “Northerners“. They are also said to be very adept at adapting to other cultures, especially to Western ideas and ideals. Both tribes have lived in relative harmony together in the Nilgiris, trading and interacting with each other for centuries. 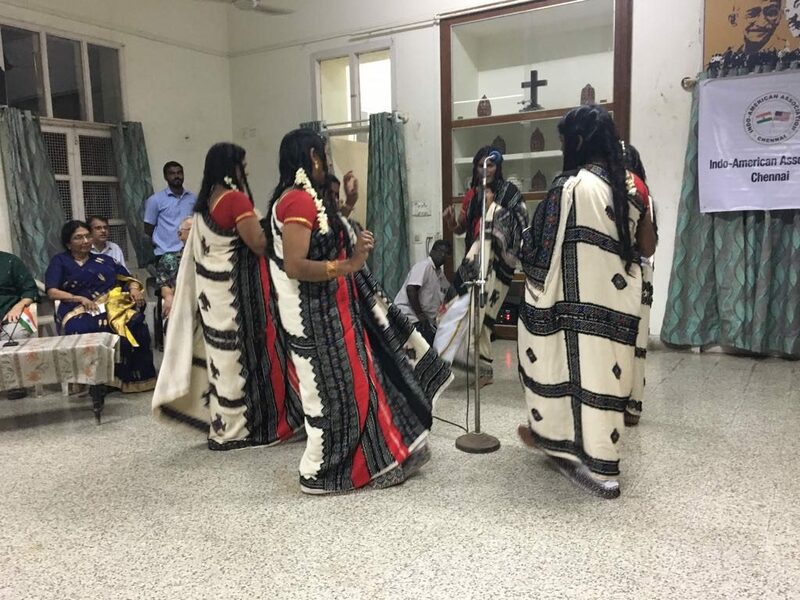 The Badagas, however, seem to be having trouble recently of keeping their status as a part of one of the indigenous tribes people of the Nilgiris. People of the Toda tribe dancing. Photo taken by Amy Paradise. The whole event was a fun time, I liked watching them sing and dance their traditional songs and dances. The Toda were the first to dance in their fully handmade and personalized garb made of black and red embroidery on white background material. The dance consisted of all of the women in a circle around the microphone, they stepped rhythmically clockwise and counterclockwise and sang a song in their native tongue. After they had finished their song and dance, they invited us to also dance with them. Some of the girls went up and tried dancing with them but the rhythm was difficult to pick up (at least for me). We messed up their dancing big time but we enjoyed it, I’m not sure about the tribes people themselves, hopefully they didn’t see it as too rude or anything. The Badaga tribe then came up and performed some of their traditional dances which we also tried joining in on, this time with a bit more people which was fun. I’ve always thought of dance as something that can help people get to know each other and have fun together, especially when we make fun of each other’s lack of rhythm or small screw ups. That’s the culture and mindset that I grew up with though, I wonder what their take on it is. People of the Badaga tribe dancing. Photo taken by Amy Paradise. After our dancing ended, the Toda tribe had some hand embroidered objects that they were selling which they laid out on a table for us to look through. I ended up getting two bags, one with a zipper and one with a string to sling over your shoulder. They are made of the same materials that make up the dress of the Toda tribe and all have different and beautiful designs.We milled about talking to the people that stayed after the event was finished and they joined us for dinner at the YWCA, the IAA had arranged our meal to be at there, which was convenient. I didn’t know the dinner was part of the entire event but apparently it was because there was more than enough food for everyone and it was ready by the time we got there. Dinner with people of the Toda (not pictured) and Badaga tribes after our event. Photo taken by Manleen Sandhu. Reyna and I were able to get a table eating with some of the people from the Badaga tribe, some of whom were about our age, which made it easier to talk to them rather than to the Toda people who looked to be older than us. We had a chill conversation with them, each culture group asking each other about the sports we did and explaining whenever one group didn’t understand the other. We also talked about food and what our favorites were. The little boy from the Badaga tribe (for the life of me I can’t remember his name even though I asked him twice) wanted us to eat sambar the proper Indian way, with our hands. So I went with him back to the buffet and got myself some rice and sambar and he and his sisters explained how to eat it together. You aren’t supposed to dirty your palms, you should crush some of the rice together a bit so that it sticks together for you to pick it up easier and you use all of your fingers. From that little experience, I contemplated all the different people I’ve watched eating while here, not in a weird way, but just observationally. Watching people here eat is, I’ve found, immensely interesting. Everyone has a different method, different levels of messiness and a different mixing method. I’ve seen people pick up their rice really high and drop it like sand through their fingers to mix it up, some just mix it up on their plates, scooping and patting it down. I’ve also seen people somehow pick up the rice in ball form (I have no clue how they got it all to stick together, honestly, it just slips through my fingers). I compare it to the way I eat, mostly with a fork but sometimes with chopsticks, sometimes with my hands (in the case of burgers and fries or pizza, I’m super Americanized, I know). There are so many different ways to transfer food from a plate to your body and I think each different way says something about the person and their personality, which I think is really cool and unique. Overall, although that day was quite exhausting, what with traveling, classes and this event, it was a cool experience that I’m glad we were able to take part in. I now have the Instagram’s and Facebook’s of some of the girls we talked to from the Badaga tribe that were our age so we’ll be able to keep in touch. A friendship across the world will be interesting to cultivate but I’ll definitely give it a try!